MOSCOW -- Workers and activists marked May Day on Tuesday with rallies to demand their governments address labor issues. 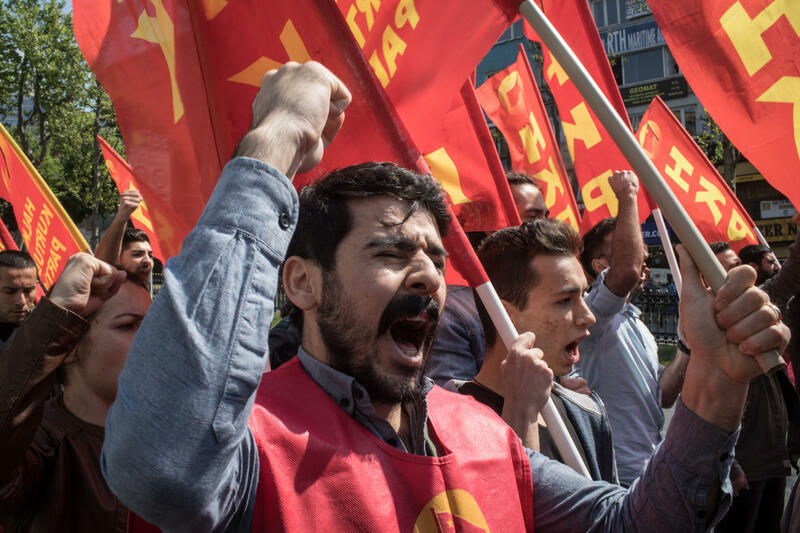 International Workers' Day is a public holiday in many countries, though activities are restricted in some places, sometimes leading to confrontations. Police in Istanbul detained more than a dozen demonstrators who tried to march toward Istanbul's symbolic main square in defiance of a ban. Turkey declared Taksim Square off-limits to May Day celebrations citing security concerns. Roads leading to the square were blocked and police allowed only small groups of labor union representatives to lay wreaths at a monument there. Still, a group of some 25 people, chanting "Taksim cannot be off limits on May 1" tried to push their way into the square but were rounded up by riot police. Spain's economy, the fourth-largest in the 19-country eurozone, has in recent years posted some of the fastest economic growth in Europe. Last year, it reached 3.1 percent.